Not to be confused with Marvel Graphic Novel. The Official Marvel Graphic Novel Collection (also referred to as The Ultimate Graphic Novels Collection) is a fortnightly partwork magazine published by Hachette Partworks. The series is a collection of special edition hardback graphic novel, collecting all the parts in a story-arc for one of Marvel's best known superheroes, often a fan-favourite or "important" story from Marvel comics lore. The series is published in the UK, Russia, Ireland, Australia, New Zealand and South Africa by Hachette Partworks, in Poland by Hachette Polska, in the Czech Republic and Slovakia by Panini Fascicule, in Argentina, Brazil, Perú and Chile by Editorial Salvat and in France and Germany by the French mother company of Hachette Collections. The first English-language issue was published in December 2011 priced at £2.99 (R29.95 in SA, $7.95 in AU) issue 2 was £6.99 (R79.95 in SA, $12.95 in AU) and from issue 3 onwards it was its normal price of £9.99 (R109.95 in SA, $19.95 in AU). In February 2016, it was announced that the collection would be re-released with alternative numbering. As well as the comic strip, each book features an introduction to the book, information on the character, writer and artist plus some of the artist's draft board sketches. 60 books are required to build up a panoramic picture on the spine by artist Gabriele Dell'Otto. In April 2014, a flyer accompanying Issue 62 revealed the artwork by Dell'Otto had been extended to cover 120 volumes rather than the original 60. Each issue number of the collection is not the same as the books volume number (e.g. issue 1 is volume 21) as the volume number is the chronological release order of the original publication, whereas the issue number is the order in which they were released within this collection. Issue 1 was launched twice in the UK. Early subscribers to issue 1 (volume 21) may have received an edition with a different spine from those that subscribed to the subsequent launch. The panoramic artwork on the spine of this edition does not align with the volumes 20 or 22. The first issue came with an extra magazine which contained information on the collection and short descriptions on some characters which will feature in the upcoming books. It also included some character history. The magazine also folded out into a giant poster depicting Marvel universe heroes drawn by Leinil Francis Yu. Below is a list of the books from each issue in published date order. 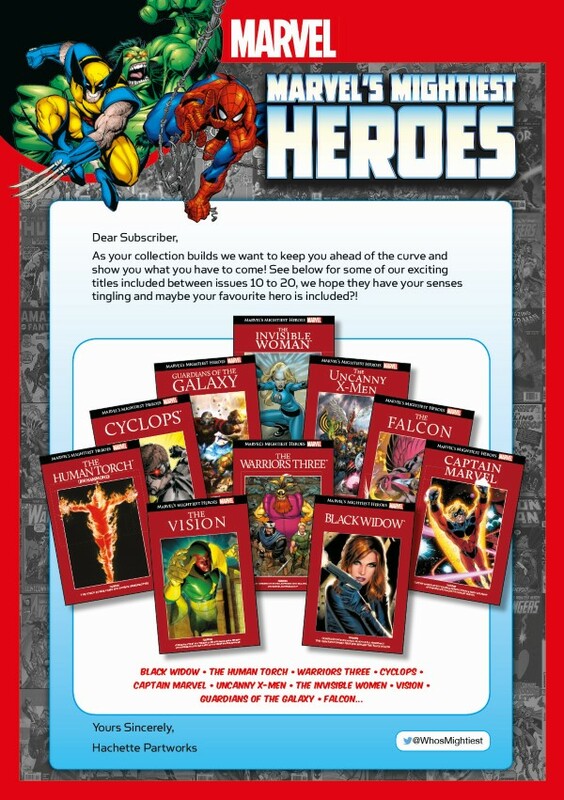 Only the first six issues were officially announced, but each issue features a further reading section which advertised future books and their volume number, though not release number. Early into the run, customer support provided a list of books to be published from issue seven onwards which was unverified, but proved to be accurate for sometime. The full list of issues was confirmed on the Hachette Partworks website but later removed as the order for some issues altered slightly. Subsequently, it was announced via the collections official website that the set would continue for a further 60 issues. The release order for Issues 73-120 was later verified via BookDepository.com In April 2016, the May catalogue for PreviewsUK confirmed that an Issue 121 would be released as part of the original collection. Subsequently, via the official Facebook page, it was confirmed that the original collection would now continue for a further 20 issues; therefore extending the set to 140 issues. On May 9, 2017, in reply to a comment on the collection's facebook page, confirmation was made that the collection will now expand to 170 titles. On Dec 20th 2017, In reply to an email, a Facebook user was told that this has now been expanded, yet again with no prewarning to subscribers, to 200. The table below contains the full list of issues as per the original printing of the collection beginning in December 2011. So far, the original collection listed is still in publication. (*) - Winter Soldier (Part 1) was released in Germany with a picture, which was in other countries used for Winter Soldier (Part 2), on the cover. In Poland, the collection has been published under the title Wielka Kolekcja Komiksów Marvela (The Great Marvel Comics Collection) since August 2012. After four issues, distributed in a limited area of Poland, the collection was suspended until December 2012, when it restarted from issue no. 1. In Poland the issues come in a different order than the one in the table below. Issue 1 was 14,99 PLN, issue 2 was 29,99 PLN, and from issue 3 onwards it was 39,99 PLN. The same collection is being published in the Czech Republic and Slovakia from January 2013 as Ultimátní komiksový komplet (The Ultimate Comics Collection), with 199 KČ / 9.99 EUR per book from issue 3 onwards. The price increased to 219 KČ / 9.99 EUR per book from issue 38 onwards and then to 249 KČ / 9.99 EUR per book from issue 56 onwards. The books (at least according to first 4 books) come in slightly different order than the one in table above. The books are sold in Czech republic first and after 4 months the unsold books are distributed in Slovakia. The collection continues with issues 61-120, none of the books is marked as Classic. In November 2015, test run of Nejmocnější hrdinové Marvelu (Marvel's Mightiest Heroes) was launched. In January 2013, the collection debuted in Germany under the title Die offizielle Marvel-Comic-Sammlung (The Official Marvel Comic Collection). 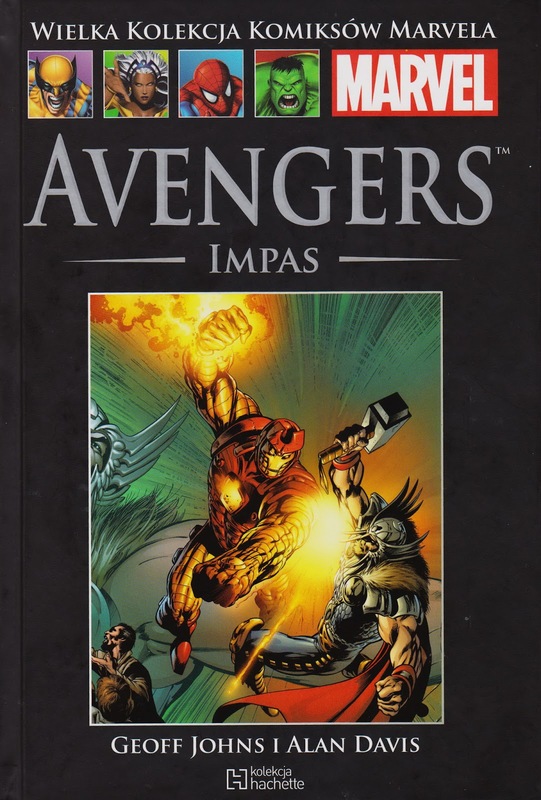 In September 2013, after an initial test run, the collection was made available in Brazil by Editora Salvat as A Coleção Oficial de Graphic Novels Marvel (The Official Marvel Graphic Novel Collection), priced at R$29,90 from issue 3 onwards. In Russia the series was launched in January 2014, under the title Marvel. Официальная коллекция комиксов (Marvel. Ofitsialnaya kollektsiya komiksov — Marvel. The Official Comics Collection). The collection is issued by the Russian branch of the Hachette in cooperation with the Panini Comics providing translation and page layout. In May 2014 the collection started in Argentina under the title Colección Definitiva de Novelas Gráficas de Marvel. The same edition began to be sold in Peru beginning in September 2015. In March 2016 a test run was launched in Romania under the title Colecţia Oficială de Romane Grafice Marvel. It is currently unknown if or when the collection will continue. In January 2018 the collection started in Hungary under the title Nagy Marvel Képregénygyűjtemény. The second series from Hachette Partworks began in January 2013, with each issue focussing on a different heroic Marvel character. This time the books built up a panoramic picture on the spine by artist Marko Djurdjević. The format featured a relatively recent story as the volumes's main feature story (billed first on the front cover), preceded by the first appearance story and in some cases another early appearance (e.g. Hawkeye's first appearance as a solo character plus his first appearance with The Avengers). Although the first four titles were announced, only three were published and subscribers were told the series had been postponed. However, the series was relaunched in January 2014 beginning with the same four issues. However, this time the books built up a panoramic picture on the spine by artist Adi Granov. This means collectors who had purchased the original three volumes would have to purchase them again to complete the spine art. In December 2015 the official Twitter account of the collection announced that the series has been extended for an additional forty issues. The series ended on 12 December 2018 after a total of 130 books. The third series from Hachette Partworks began in August 2018. The fourth series from Hachette Partworks will begin sometime in 2019. This page was last edited on 19 April 2019, at 08:07 (UTC).